MLB Seeing Another Excellent Rookie Class; Who Deserves to be ROY? Last season, 14 rookies hit at least 10 home runs, tied for the highest number since 2007. This year, it is quite possible we may exceed that number. Regardless, 2015’s rookie class is as strong as any we’ve seen no matter how you choose to quantify it. As a result, this year’s Rookie of the Year race is as tightly bunched as ever. Now, “rookie” isn’t always a cut-and-dry term; because of service time rules, players that broke onto the scene last year — like the St. Louis Cardinals’ Randal Grichuk — are still in the running despite not being true novices. But baseball is increasingly becoming a young man’s game. Some rookies, like the Houston Astros’ Carlos Correa, have put up a season’s worth of big numbers in just a couple of months in the majors. There is such a tremendous dearth of talent in baseball today that age is no longer is a roadblock. Correa is a prime example; even at the ripe age of 20, his skills are virtually unrivaled in the game. 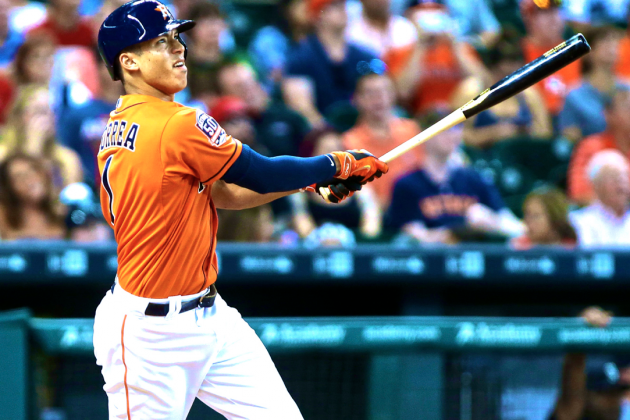 Carlos Correa, SS, Houston Astros: What an impact Correa has made. Forget that he’s just 20, if you can; Correa is doing it all for the first-place ‘Stros. His 14 home runs are fourth on a club leading the big-leagues in that category, and third among all rookies in baseball. He also leads all rookies with at least 100 at-bats with a .912 OPS. He steals bases (eight), hits for average (.291), and plays jaw-dropping defense. Odds: 5/4. Billy Burns, OF, Oakland Athletics: Burns has been a pleasant surprise for the cellar-dwelling A’s, as his 22 stolen bases not only lead all rookies but rank second overall in the AL. He leads all qualified rookies in the Junior Circuit with a .291 average and .333 on-base percentage and is second among all first-year players with 99 hits. Odds: 3/1. Devon Travis, 2B, Toronto Blue Jays: Had Travis not missed over a month earlier this season and were not currently serving his second DL stint, he would have as good a chance as any rookie for the award. He is batting .304 with eight homers and 35 RBI and an .859 OPS. But his nagging shoulder problems really set him back and will probably cost him a chance to earn hardware. Odds: 6/1. Steven Souza, OF, Tampa Bay Rays: Souza has some serious power and you know his defense from his incredible, no-hitter-saving catch with Washington in last year’s season finale. But he might be a tough sell for ROY given that his .214 batting average belies his 15 home runs, which rank second among all rookies and lead the AL. Odds: 10/1. Nate Karns, SP, Tampa Bay Rays: Karns leads all rookies in strikeouts (113) and AL rookies in wins (six) and starts (21), helping stabilize a rotation hammered by key injuries to Alex Cobb, Drew Smyly, and Matt Moore. Odds: 15/1. Lance McCullers, SP, Houston Astros: McCullers has posted a 3.17 ERA over 76 2/3 innings and 14 starts, striking out more than a batter an inning. His chances were hurt by his last start, a dreadful outing in Arlington in which he surrendered six earned runs while recording just one out. Odds: 20/1. Delino DeShields, OF, Texas Rangers: The former Rule 5 pick has been a table-setter for the Rangers, with 18 stolen bases and a .363 OBP. He also is third among all rookies with 48 runs scored. Odds: 25/1. Preston Tucker, OF, Houston Astros: Tucker has 10 home runs and a .786 OPS but will ultimately be overshadowed by a deep rookie class. Odds: 45/1. Kris Bryant, 3B, Chicago Cubs: Bryant’s chances will get a major boost if the Cubs sneak into the postseason, but he is worthy of the award either way. He leads all rookies with 61 RBI, and he is second among NL rookies in homers (14) and stolen bases (10). That will help offset his dubious distinction of being the overall National League leader in strikeouts (131) and an underwhelming .246 batting average. But he has been clutch, hitting .310 with RISP and blasting a walk-off home run against Colorado on July 27. Odds: 3/2. Randal Grichuk, OF, St. Louis Cardinals: As we alluded to in the intro, Grichuk was already something of a known commodity this year after belting a pair of postseason homers last October. The 24-year-old outfielder who was picked one spot ahead of Mike Trout in the 2009 Draft leads all rookies in extra-base hits (40), including seven triples. Once he qualifies he will crack the top 10 of all players in baseball with his .908 OPS, and he covers a tremendous amount of ground in the outfield. Odds: 2/1. Chris Heston, SP, San Francisco Giants: Heston seemingly came out of nowhere, emerging as a legitimate No. 2 starter behind Madison Bumgarner. He leads all rookies with 11 wins and NL rookies in strikeouts (102) over 22 starts. He also earned national recognition by no-hitting the Mets at Citi Field on June 9. Odds: 3/1. Matt Duffy, 3B, San Francisco Giants: Speaking of unheralded Giants rookies, Duffy has done more than enough to help Giants fans forget about Pablo Sandoval. In fact, Duffy’s 2015 season has undoubtedly been better than Sandoval’s, as he leads all rookies in average (.309), hits (108), and wins above replacement (3.6) while placing second with 51 RBI. He also has been remarkably consistent, compiling 10 games of at least three hits. Odds: 4/1. Noah Syndergaard, SP, New York Mets: Syndergaard appears to be getting better every start, and the 6’6″ righty known as “Thor” trails only Heston among NL rookies in strikeouts (100) despite making seven fewer starts. His impressive 1.06 WHIP is a product of a whopping 5/1 strikeout-to-walk ratio. In his last two starts, Syndergaard has gone eight innings, walking none and striking out nine. Odds: 5/1. Joc Pederson, OF, Los Angeles Dodgers: It’s fair to wonder what the Home Run Derby did to Pederson’s swing, as he blasted 20 home runs before the All-Star break and just one since. Though he has a comfortable lead among all rookies in homers with 21, all but three of those have been solo shots, and like Bryant he is a strikeout machine, trailing the Cubs’ third baseman by just one in that category with 130. His .221 batting average won’t do him any favors, either. He is a highlight reel in center field, but that likely won’t be enough to help him nab the award. Odds: 7/1. Maikel Franco, 3B, Philadelphia Phillies: Franco has impressive power, belting 12 home runs in 280 at-bats while hitting .286 and driving in 47 runs. He also has posted an .842 OPS. Odds: 12/1. Odubel Herrera, OF, Philadelphia Phillies: Herrera might best be remembered nationally for his awkward, tumbling catch to seal Cole Hamels’ no-hitter, but the truth is he’s had a stellar rookie campaign for baseball’s worst team. He leads all rookies in doubles (22) and is fourth in hits (90), while also stealing nine bases. Odds: 15/1. Yasmany Tomas, 3B, Arizona Diamondbacks: The coveted Cuban was inked to a six-year, $68.5 million deal and has had a solid if unspectacular season, batting .298 with six homers and 39 RBI. Odds: 25/1. Jung Ho Kang, IF, Pittsburgh Pirates: The versatile Kang has helped offset the loss of the injured Josh Harrison, batting .291 with eight homers and 35 RBI over 90 games split between shortstop and third base. Odds: 30/1. Michael Taylor, OF, Washington Nationals: Taylor has returned strong after briefly being sent back to the minors in April, as he leads all NL rookies with 13 stolen bases. He also has 10 homers and 46 RBI. Odds: 35/1. Anthony DeScalafani, SP, Cincinnati Reds: DeSclafani has been on a roll of late, with two dominant winning starts over the St. Louis Cardinals in less than a week. He trails only Heston and Syndergaard among NL rookies in strikeouts (95) and has allowed less than a hit per inning over 126 innings, second among all rookies. Odds: 45/1. Ben Paulsen, 1B, Colorado Rockies: Paulsen and his wonderful mustache might get overlooked and disregarded because he plays his home games at Coors Field, but his .300 average, eight homers and 34 RBI are noteworthy. Odds: 50/1. Kyle Schwarber, C, Chicago Cubs: Schwarber has gotten off to an amazing start, but considering he’s only played in 26 games, it’s hard to imagine he will leapfrog the field despite hitting .350 with six home runs and a 1.085 OPS. Odds: 75/1. Be the first to comment on "MLB Seeing Another Excellent Rookie Class; Who Deserves to be ROY?"